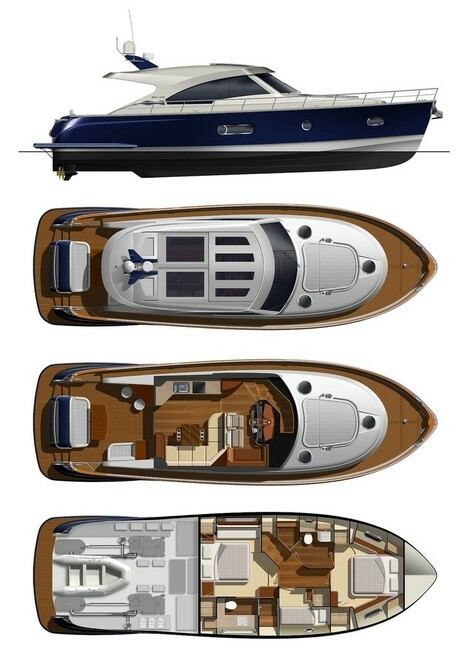 Targeted at the discerning international boating enthusiast who values timeless character, exclusivity and repeatable quality, Belize Motoryachts are designed and manufactured according to the unofficial luxury industry principles of ‘no shortcuts; no compromises’, offering the highest level of comfort, individuality and performance. 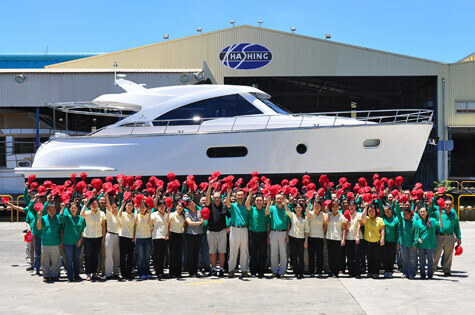 The Belize 52 is manufactured by the Australian company Belize Motoryachts in collaboration with ISO-certified Kha Shing, a Taiwanese artisanal-based custom boat-builder who boast over 35 years experience building more than 1300 vessels ranging in size from 45 feet to 185 feet. Working shoulder-to-shoulder with Wes Moxey, Kha Shing adapted to Belize’s complex production techniques, delivering on sublime details, such as introducing gutters under sliding windows to redirect condensation back overboard, via a hidden central plumbing line. Taking aesthetic detail cues from the luxury automotive industry, as well as timeless timber-based European boats from the art deco-era of the 1920s and 1930s, the Belize 52, with its gradually swooping roofline, taps into the upsurge in affection for original classics, without sacrificing for space. Tantamount to experienced thinking and artful computer-aided design, the sheer of the low-profile Belize 52 remains flat before gently rising to the bow, while still delivering great space in the decks below – generously-sized beds, heads and showers, and a roomy saloon. 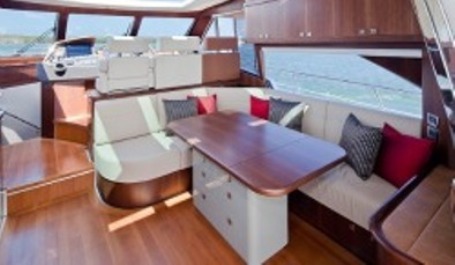 The substantial teak-capped bulwark delivers secure side access for drier passagemaking and ease of docking. 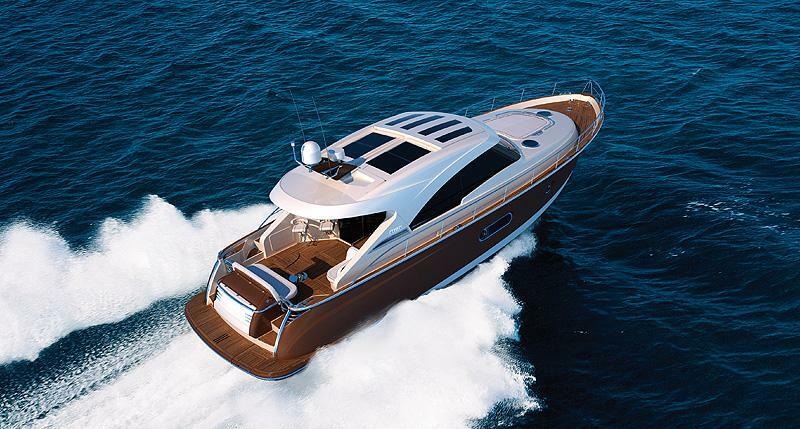 Designed specifically with the Cummins Zeus Pod drive system in mind, the boat’s warped-plane hull features scooped pod tunnels and a scooped arc/turned-down chine in the bow, meaning it can cruise in a smooth and stately fashion. 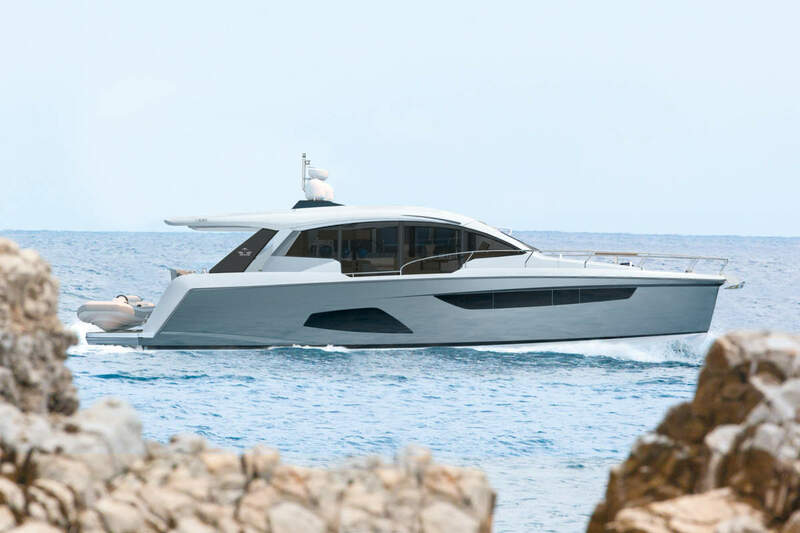 The Belize 52’s exterior and svelte interiors have been designed and luxuriously appointed by in-house lead designer, Stephen Ford, ex-Sunseeker and Riviera, and Belize’s external consulting partner Giorgia Drudi, a former Ferretti Yachts interior designer. Working under the direction of Wes, the pair opted for an ultra-modern, functional-plus interior that evokes the spirit of classical boating traditions. 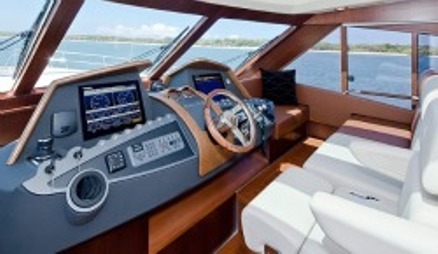 Contemporary fabric panel walls, satin varnishes, leather, weatherproof leatherettes and accents of woodgrain provide warm and intimate ambience; two-pack soft touch finishes accent and protect key surfaces in the galley on door panels and other joinery interludes. 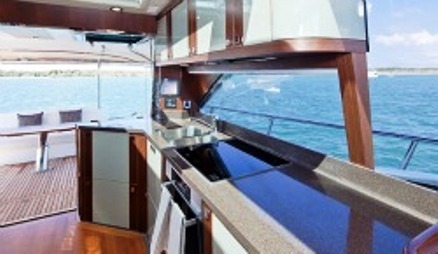 As one would expect of a luxury cruiser of this caliber, the spacious galley features all the mod-cons (Miele induction cooktop, combination oven/microwave, Grohe tapware and AC/DC Vitrifigo refrigeration and freezer system), coupled with an L-shaped seating area that doubles as lounge and dinette. Elsewhere, the air-conditioned helm itself is attractive and highly detailed, giving off a luxury automotive sense and feel. Details include hand-stitched leather edging and a soft, a high-quality leather hood, Treben Electric Italian leather helm chair, backlit stainless steel switches and a steering wheel with adjustable tilt and a two-pack paint soft touch finish. Cognisant of the continuing influence families have in the purchase – and enjoyment – of a boat, the Belize helm was designed with space for a partner to sit side-by-side, or even lounge, next to the owner/skipper. Performance-orientated, twin 600hp Cummins QSC 6 cylinder turbocharged diesel engines deliver impressive performance and fuel economy. The Belize 52 has a top speed of around 30 knots, cruise speed of 25 knots and a cruise range of 400nm at 22 knots with a safe 10% fuel reserve. Tank tested by the Tasmania-based Australian Maritime College, it’s an outstanding motoryacht: a flawlessly designed, styled and engineered sea-running boat. 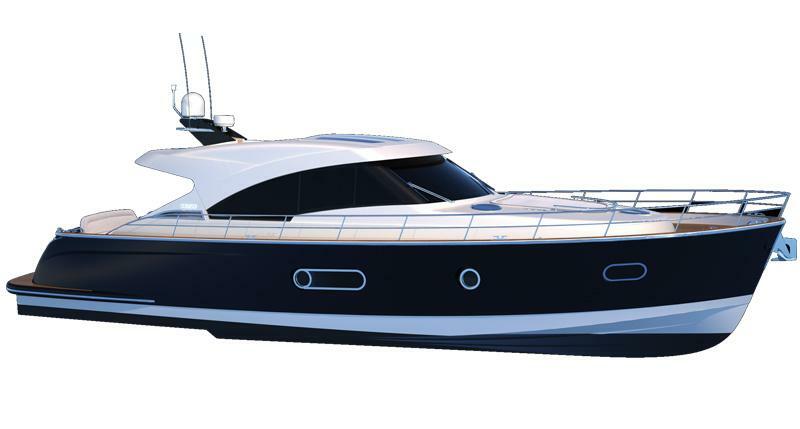 Limited in production due to its semi-custom status, Belize plans to manufacture only nine boats in their first year, with a maximum of 30 per year by 2015. 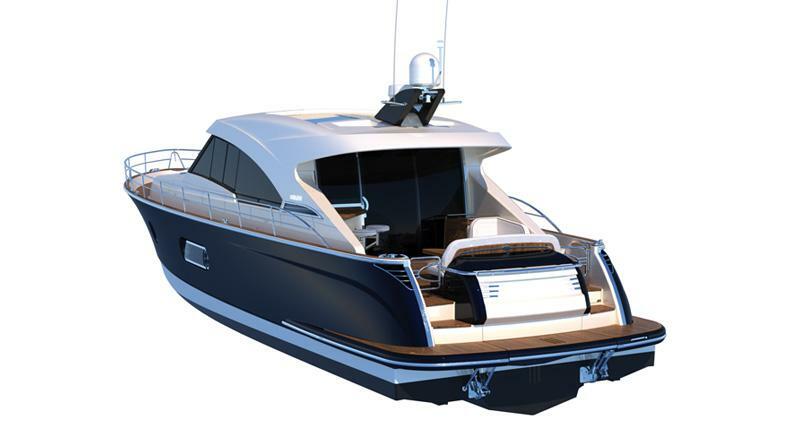 Two vessel variations are on immediate offer: the Belize 52 Hardtop, a single-level, weather-proof, sports yacht-style make, ideal for entertaining and social pursuits (one continuous level of luxury); the Belize 52 Flybridge is the ‘wind-in-the-hair’, split-level sibling variation, with second upper helm station, elegant curved deep-tread staircase, hi-lo table and L-shaped lounge. 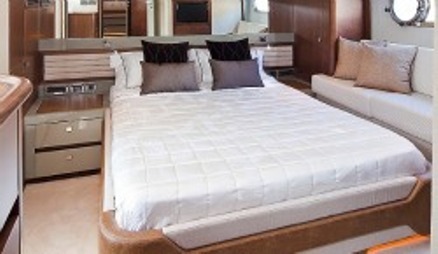 Customers of the Belize 52 are encouraged to work with Wes and the team on bespoke options. In keeping with Belize’s emphasis on repeatable quality, made-to-measure options range from the motoryacht’s layout (number of cabins and cabin sizes), to timber choices (Walnut, American oak or teak), colours and elements.